Grape harvest cannot be achieved by a single farmer. The window of time from when a grape ripens till it rots is relatively short, so that our farmer must recruit help for the occasion. 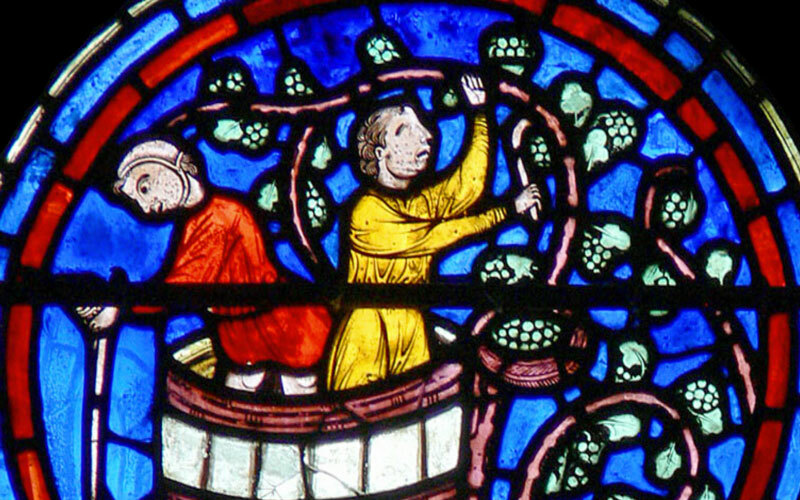 Therefore, the Chartres September window is the only labor of twelve that features two laborers. Given that we associate grape harvest with work on the emotions, this fits doubly well, as the emotional center is the mechanism responsible for our interaction with others. As I write these lines, my body is yielding innumerable complex actions. My moving center translates my mind’s ideas into motions that press the keyboard to compose letters, words, sentences, and paragraphs. In parallel, my instinctiv e center breathes, digests, scratches, circulates blood and lymph, monitors and adjusts body temperature, etc. The harvest of these two centers is immense and continuous. It is precise, and as long as I’m physically healthy, it is flawless. This seamlessness is independent of any effort on my part and does not require my attention. “Inner instinctive work does not need to become conscious,” says Peter Ouspensky in this regard. “It is conscious for itself, independently of the intellectual function, and there is no need to increase this.” By this token, the harvest of hay — symbolic of work on the body — doesn’t require human refinement. The farmer gathers it and stores it as it is for feeding livestock all year round. My mind also yields an incessant harvest of thoughts. These circulate with each breath, re-living my yesterday or anticipating my tomorrow, even during sleep at night. Unlike the body’s harvest, however, most of these thoughts are useless. They hardly sustain or improve my functioning. Therefore, the mind’s harvest must be refined, which is why wheat — symbolic of work on the mind — is not only reaped, but also threshed, winnowed, and ground. Without these steps, it would be too coarse to serve as human food. This refinement has been our July and August work: observing our thoughts, separating the useful from the useless, and refining the useful into potent aphorisms that can fit the moment. These aphorisms, like grain, can then preserve. They can feed a village throughout the rest of the year and serve as its communal granary. Our September labor will now introduce the same discipline to the realm of our emotions. If our body daily yields a harvest of impulses and our mind a harvest of thoughts, what is the yield of our heart? The challenge of this labor will be to observe our emotions impartially and resist the urge to change them. But we must bear in mind that October will be the month of refinement, the second step of grape harvest, symbolically portrayed as barreling and fermentation. We cannot jump to the second step without completing the first, and we cannot act upon our emotions without first properly observing them. Therefore, whilst in September, let us observe the nature of our emotional center as it is, and share our observations in the commentary below. How many emotions has your heart yielded since the beginning of this day?